As Jessica Bertsch nears her sixth year of business, she reflects on the Powerhouse story and what’s ahead. Sometimes life puts you on a path you didn’t even know you were meant to travel. The founder and president of Powerhouse Planning never aspired to be a business owner. Jessica Bertsch’s background was in higher education, working at colleges and universities until she married a United States Coast Guardsman. The frequent relocations associated with his military service eventually led to the realization that she would need to pivot her career plan. Jessica says the experience she gained at that firm allowed her to see firsthand what a succeeding venture looks like, which included an increase of human capital and a focus on expanding the firm’s vision. By the conclusion of her work there, the company had increased its revenue by 750%. Around the same time, the Bertsch’s were beginning to discuss the future—including growing their family. Part of those talks included the reality that her husband’s career would demand some periods of separation for sea time, typically alternating tours every two years. Still, Jessica didn’t want to give up on the resume she had worked hard to build. She would find a way for home and professional life to coexist. “As we started talking about having a family, I was trying to figure out how we could grow our family but still allow me to have a career and support him out at sea. That’s when someone came to me and asked if I would do some freelance work,” she said. But average isn’t Jessica’s way of doing business. Instead, with encouragement from her husband, she decided to approach the newfound profession in a bigger way. “I decided to just go for it,” she shared. So roughly five years ago, Jessica founded Powerhouse Planning, a company comprised of freelance team members who partner with and support businesses as a whole, and Powerhouse has experienced upward mobility ever since. Not only did she lean on her own education and employment skills, but she also sought out a highly underutilized talent pool: military spouses. Because of the company’s structure, Powerhouse is able to provide a wide range of services at a price favorable to clients’ bottom line because it includes no overhead costs. The team is built on talent, not location. By working with a fully virtual workforce, Jessica recruits and retains contractors based on performance and skill regardless of geography, a tactic highly favorable to a demographic often on the go because of military orders. 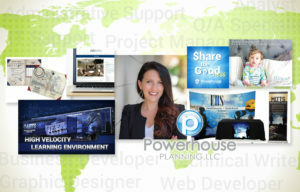 The company’s portfolio includes supporting a mix of small- to mid-sized firms with their business development, company development, marketing, and internal and external communications. Jessica says that just as she revised her own employment plans during those early years, she applied the same approach to Powerhouse to maximize the company’s efficiencies. And it was an effective strategy because in just five years of operation, the firm has seen advancement. Retention and consistency are among the core values of Powerhouse’s foundation. Jessica streamlines the process for clients by assigning a single point of contact to them, while striving to connect them with one set team of freelancers. Once Powerhouse partners with a client, the team immediately joins in on the client’s mission; seeing that business prosper becomes a top priority. “Because we are smaller, I feel we have a larger sense of ownership with these clients,” she added. To learn more about Powerhouse Planning’s founder, click here: Jessica Bertsch.